A comic, fantastic piece with a manual for viewing contemporary dance. The creation process of a dance piece is the absolute world of the dancers, in which they tread safely and playfully like eternal children. 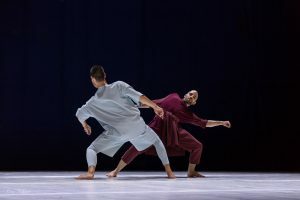 “In her new piece, Plan B, Michal Herman collaborates with Inbal Shahar. Together they mock those who obey instructions unquestioningly, be it those given by air-hosts before take-off, in the rehearsal room or by the military spokesperson. In her colorful and daring way Herman succeeds in bringing to the stage a ridiculous reflection of us as humans. She hits us in our soft bellies, and makes us doubt and undermine the concept of being tempted to buy”. – City Mouse, Tel Aviv.